Books: Students are allowed to check out one book at a time during their scheduled class time or during before and after school library hours. Books may be checked out for a period of two weeks. If a student needs more time, he/she may re-check out the book. 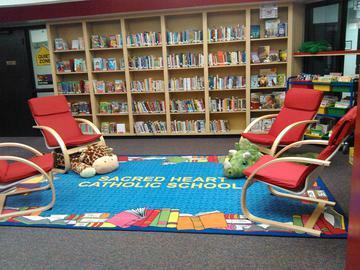 AR: Sacred Heart Catholic School participates in Accelerated Reading. Students may take AR tests during their scheduled library time or at the times listed below. Monday - Friday: 7:30a.m. - 7:45a.m. Monday - Thursday: 3:30p.m. - 4:30p.m. Each grade has a scheduled Library time. PK3 - 5th Grade visits the library for 30 minutes. 6th - 8th Grade visits the library for 55 minutes. Below is the link to the Sacred Heart Catholic School library card catalog.